In Hermanus you will fall in love with the large variety of Fynbos scattered throughout the town. Hermanus is the official Whale Watching Capital of the World. All the way from Antarctica about 60 to 100 Southern Right Whales, Humpbacks, and Bryde Whales make Walker Bay their home from July to December yearly. They breed and rear their young in the local seas. Tourists can get close to these magnificent giants with boat tours or take a walking tour that leads to hidden coves where Whales love to frolic in and often come within 10 meters of view. On many occasions, you will also see penguins, cape fur seals, sea-birds, as well as pods of dolphins. Fall in love with the sea and the glorious creatures Hermanus has to offer. On sea kayaking tours you will enjoy up close sightings of cape fur seals, penguins, cormorants, and other seabirds and marine mammals. Along with an experienced guide, these tours let you explore the magic of Hermanus' unique coastline with its abundant marine life, views of the majestic mountain, and sea cliffs. For the adrenaline junkies, sandboarding is definitely a reason to love Hermanus during the hot summer months (October to March). It is sure to have your heart pumping, as you learn the simple skills of zooming down the sand dunes at full speed. Sandboarding enthusiasts can try out the small gentle slope of about 100 meters that run into the sea, or if you are brave enough the 45 to 60 degrees slopes which 300 to 400 meters in length could be the thrill you seek. Sandboarding competitions are often held in Hermanus at these acute slopes, while paragliders also take advantage of this phenomenon. 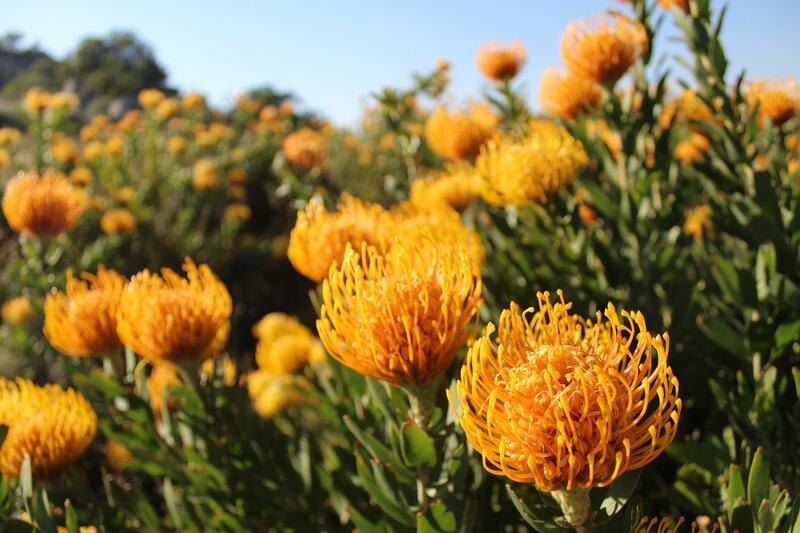 In Hermanus you will fall in love with the large variety of Fynbos scattered throughout the town, however, the best place to admire these beautiful flowers is at the Fernkloof Nature Reserve. Situated in the Voelklip, the reserve is home to over 1 474 species of Fynbos. There also are information boards, well-kept hiking trails and a waterfall in the reserve. It is an ideal habitat for over 130 species of birds, mammals, reptiles, and amphibians. While exploring the reserve you may encounter Grey Rhebok, Baboons, Cape Grysbok, Klipspringer, Mongoose, and Dassies. The common birds in the area include Cape Sugar Bird, Sunbirds, Rock Thrushes and Rock Jumpers. Blessed with an incredible wine valley, Hermanus boasts 20 wineries, 10 tasting rooms, 5 restaurants, and over 100 wines to sample. Set in majestic mountainous scenery, the cooler climate allows wine makers to produce world-class Sauvignon Blanc, Chardonnay, and Pinot Noirs. While sipping on wine, accredited tour guides educate and inform tourists of loads of relevant wine information. Their knowledge includes the history of wine, vine and grape cultivation, cellar processes, barrels, corks, exports and tons more. While the residents of Hermanus are the heart and soul of the town as they provide visitors with the unforgettable holiday experience, the sights and activities in the town are a delight on its own. Contact Hermanus Property Sales today for more information about this beautiful town and find out how you can own your own piece of heaven in this loved town.